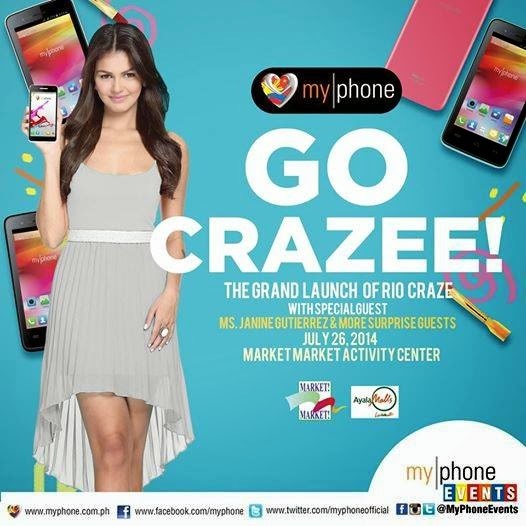 MyPhone is going to make the local market go "Crazee" today as it will launch its most affordable Kitkat smartphone to date with a price of Php 1999 - the MyPhone Agua Rio Craze. The phone, which is the newest and cheapest addition to the Rio line up, is believed to have a 4-inch WVGA display, dual-core processor, 256MB of RAM, 512MB of ROM and Android 4.4.2 out of the box. There are various colors to choose from with interchangeable back covers. This will be a nice buy for you when you are in the market for sub-2k capable smartphones. The event will kick off at 3PM on July 26, 2014 at Market Market Activity Center in Taguig and will be filled with fun activities, performances, give-aways and prizes!